You’ve probably seen their art. That’s the nature of public art. It’s in our lives whenever we’re in public places. Sometimes it’s startling and hard to ignore. Other times it blends into the urban environment seamlessly. Seamless and artistic is a difficult balance to achieve, but Jean Whitesavage and Nick Lyle are a pair of Whidbey artists who have managed that for years with art that’s lasted for decades. 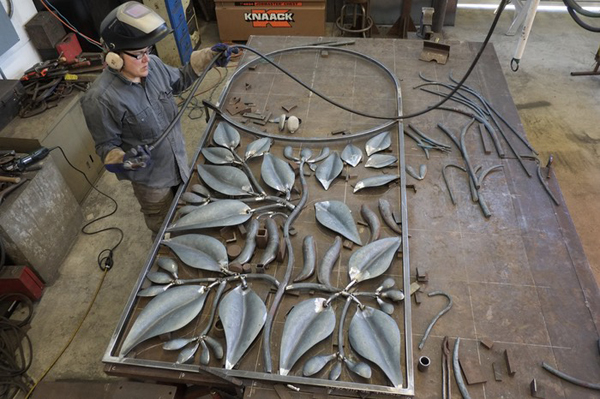 They are sculptors who work in metal, steel mostly, on public art projects around the country. Their work has found a home in San Jose, New York City, and Portland. Closer to home, you can find their art in Wenatchee, Olympia, and several places in Seattle, including the gates to King Street Center. For art on the island, take a walk through Langley. They haven’t forgotten about us. Langley knows how to value local artists. Their pieces can be big, as in 50 feet long. That would be impressive enough if it was one piece of metal, but works like that are built from hundreds of pieces that must be designed, built, treated to survive outdoor urban environments, and then assembled. Whitesavage says that each piece travels from paper to metal to the forge, and then joins the dance as the final work is assembled. Each piece takes a while to make the journey. 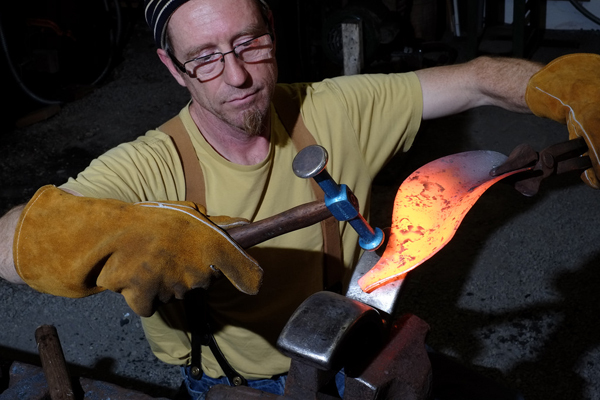 Hand-forged steel works well for them because it’s durable and adaptable. 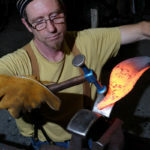 Hand forging means lots of heat, noise, and sweat. That makes it tough to visit their workshop in Freeland without eye and ear protection. They’ve been working on the island for a little more that a decade, after spending fourteen years in Seattle. Both Lyle and Whitesavage are from the east coast but moved west as they settled in a series of art communities. That, and finding a Bush Point beach house online, brought them here. Their success as artists and the subsequent need for a dedicated and large workspace that wouldn’t bother the neighbors moved them to a twelve-acre property amidst 80-year-old trees. Finally, a place to get noisy. Lyle built the shop and the house, they sold the beach house, and settled in to home and work. Competition for public art projects is typically tough, but it became tougher during the Great Recession. Public expenditures received greater scrutiny, and more artists began to compete when private patrons pulled back. Nothing happens quickly. 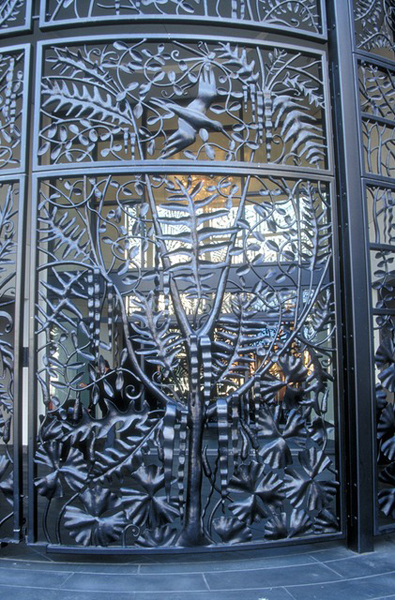 Public art is created and installed after lengthy application, design, and coordination processes. Large projects like the gate for King Street Center can take more than eighteen months. The good news is that creating art can be a joy. Making money as an artist is a special pleasure, but the greatest gratification can be seeing the public weave the art into their lives. Whitesavage and Lyle found out by accident that at least one piece has been independently declared “iconic.” A stylized picture frame near Adobe Software’s offices in Fremont was installed about twenty years ago. 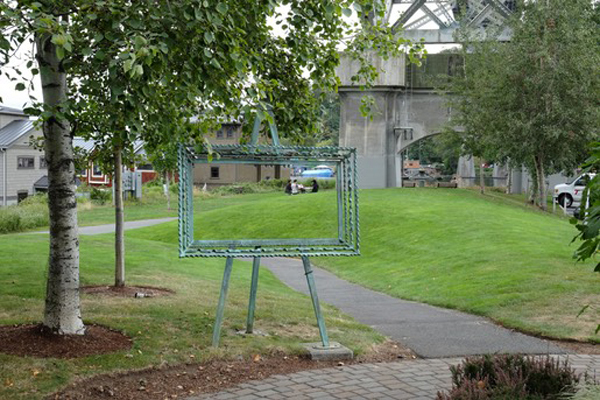 They remembered it, of course, but hadn’t given it much thought until someone decided to compile a list of Seattle’s iconic public art, and their frame made the list. A window frame becomes an obvious foil for selfies, and the internet has more than enough examples of people playing with Whitesavage and Lyle’s creation. Ironically, public art gets the greatest exposure, but the artists themselves can get the least recognition. Public promenades aren’t the only place for the art of Whitesavage and Lyle. As their work becomes more appreciated, they are also receiving private commissions. The early phases of creating private works are much easier because there are fewer people to negotiate with, but being private, the artists may never see their work again. On the positive side, some of the settings are spectacular gardens and landscapes. Whitesavage is a self-declared “garden geek,” so the opportunity to play in someone else’s garden has its own benefits. The world swirls and public art that led to private art leads back to public art. People familiar with Whitesavage and Lyle’s private works are also in charge of public art projects. They encourage the couple to submit designs for various proposals. Something similar happened in Langley. It may not be one of their bigger pieces, but anyone who has visited Langley’s City Hall has seen one of their creations. As you walk to the front door, you’ll pass the radish trellis. 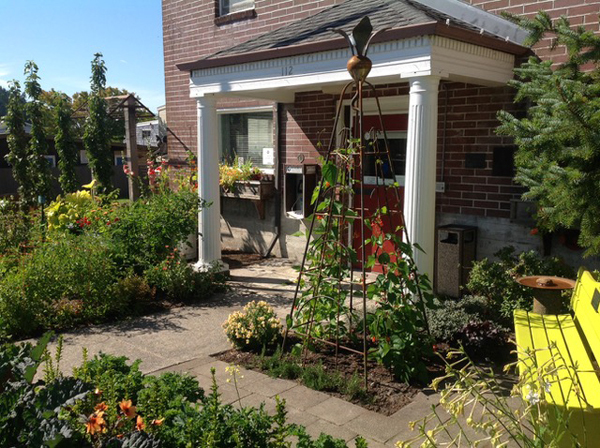 It’s a tall and functional sculpture that’s used for a different crop every year as part of the edible garden initiative managed by the Langley Main Street Association. In this case, rather than create a finely polished structure, it was felt that something more organic would fit better. It looks rusty because it’s supposed to rust in place. Public art can seem to have abstract benefits that are hard to relay to some politicians. The radish trellis has already produced at least one tangible result, though. One young couple credits it, its purpose, and the people who supported such projects as the reason they moved to the island. Proof that public art “works” and becomes part of the fabric of people’s lives. Whitesavage and Lyle’s art progresses. They’re exploring other materials because that is the nature of art — to create instead of stagnate. They’re also going to exhibit their art more openly on the island. Pieces have already been included in shows, but they are looking forward to a major exhibit at Museo in October. They’ll probably have to work a bit smaller than those King Street Center doors, though. Tom Trimbath is an author, nature photographer, and a project consultant. 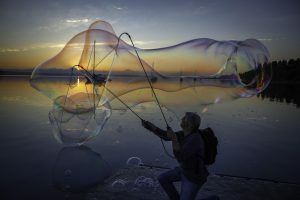 He has written and self-published six non-fiction titles, and produced five photo books of Whidbey Island. He also has managed several social media campaigns for authors, artists, and non-profits.